Guys I have 4 projects today that include metallic gold leaves, metallic silver paint, a cute little stool, and a framed mirror. I would also like to hear your opinions about wreaths. I think I mentioned earlier that I’ve been cleaning out the workshop. I really have this time. Wait until you see it. Anyway, while organizing, taking odds and ends to the booth, and sorting stuff I put together the quick projects from some of my stash. I didn’t even do a step by step because they are so simple. I will tell you what products I used. 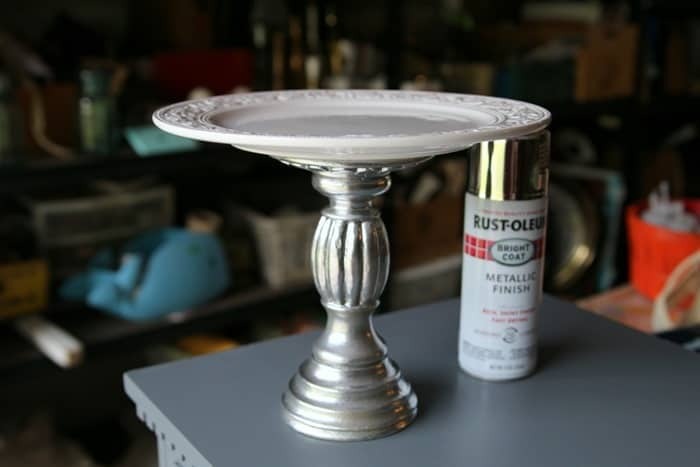 The candlestick was a yucky brown and I sprayed it with Rustoleum Bright Coat Metallic Finish. 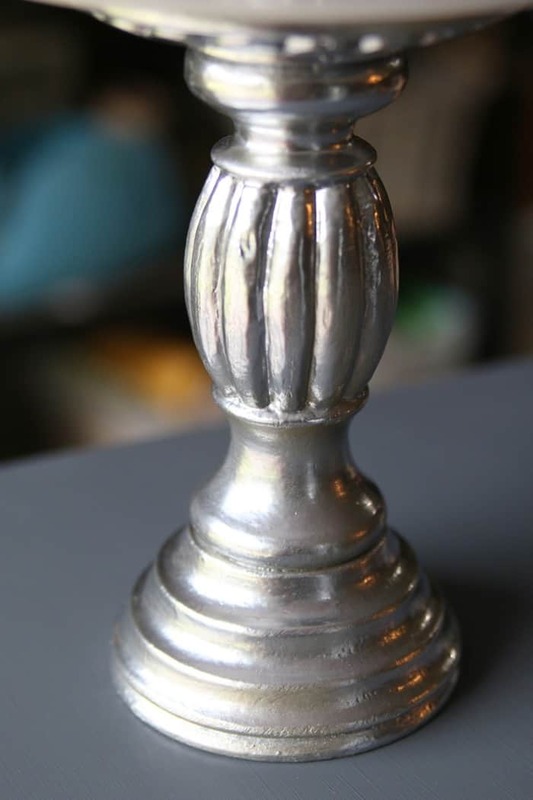 This is the best silver metallic paint ever. 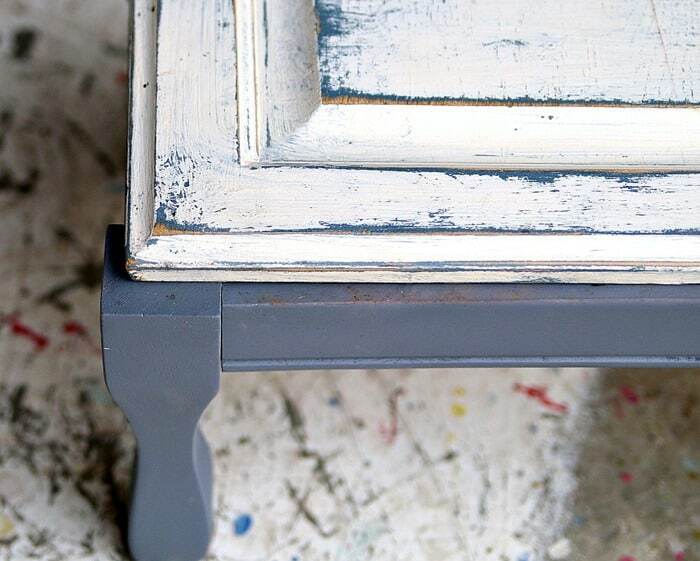 I used it on this furniture makeover …Turquoise Chest. I don’t have a photo of the candlestick before because I didn’t plan on posting about it. 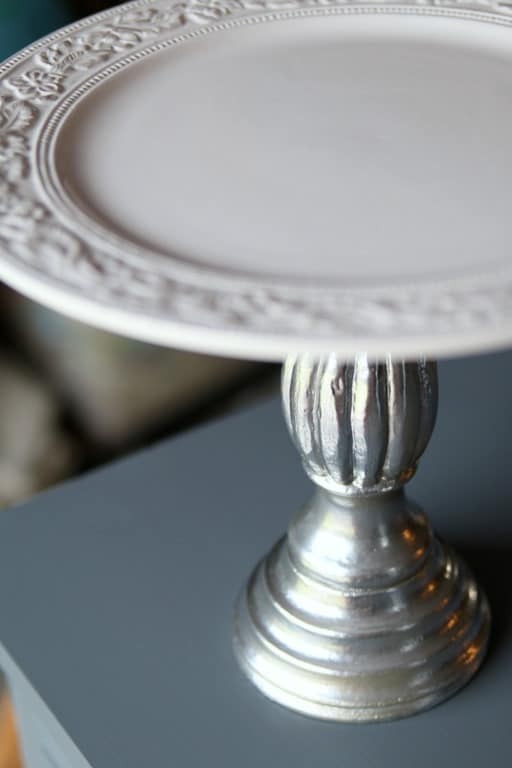 I glued the white plate to the candlestick using Gorilla Glue and let it sit upside down over night. The next day it was ready to go. The plate is another thrift store find. You can’t go wrong with white and the raised design is pretty. The piece will make a nice serving platter or display piece. I see chocolate chip cookies. The metallic finish is super shiny. I plan to use this spray paint on a lot of Christmas projects….and maybe pumpkin projects. Still thinking. The frame for my $8 mirror was a really horrible pinkish color. It had to go. 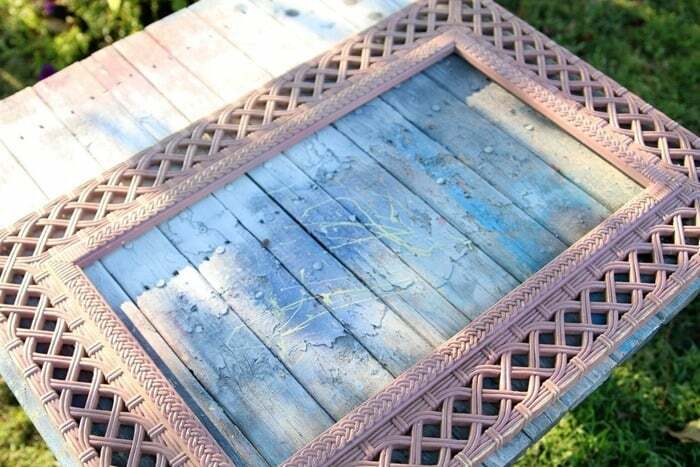 I used Krylon spray paint for the mirror frame. You can see me leaning down to take the photo. Hi. 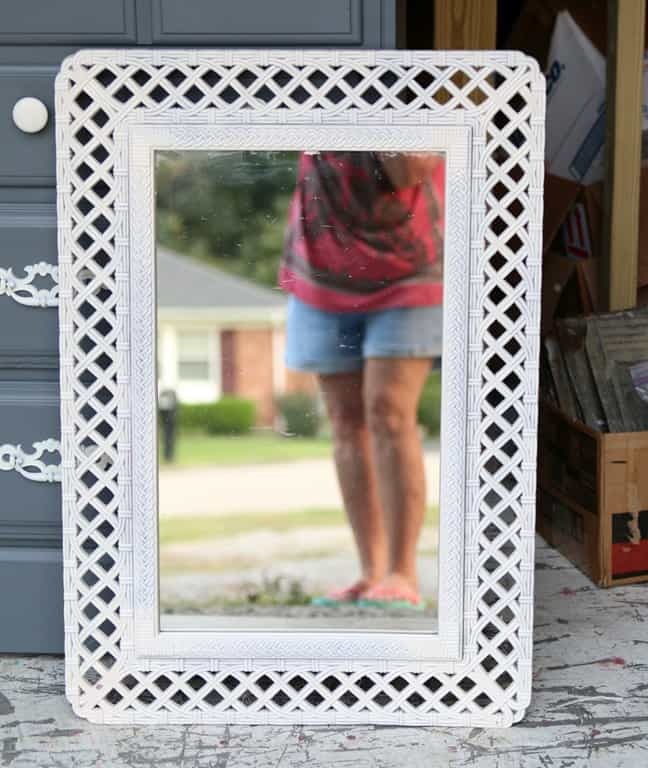 The stool base was an auction buy. The top of the stool was sadly warped and the JTS and I worked on it repeatedly with no luck. I finally tossed the top and was thinking of tossing the base when I ran across the small cabinet door. I did a distressing technique on the door when I was teaching furniture painting classes. It was a sample showing how to layer paint. The colors matched the stool base perfectly. I got out my Airstrike Nailer and nailed the cabinet door to the base in no time. It might look different for a footstool but I would call it unique. Especially when writing up the price tag (insert Kathy smiley face). 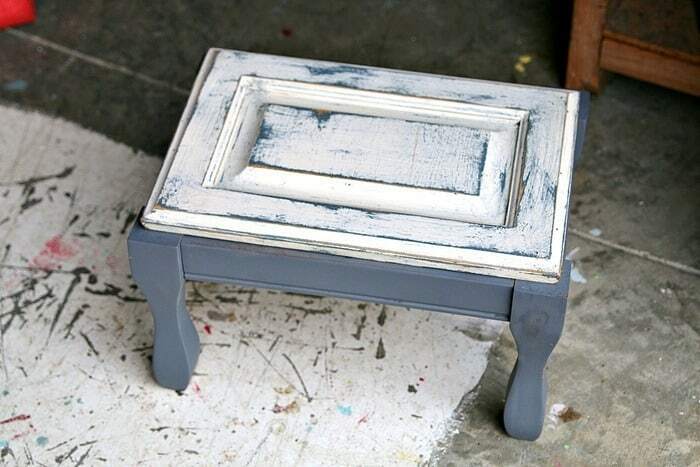 That layered paint is making me think I need to do that technique on a piece of furniture. Next project is the Fall wreath. I bought the cute grapevine wreath at the junk shop in Metropolis, Illinois. It was $1. I have several of the bushes with metallic gold leaves in my stash. I bought them when a locally owned home décor store went out of business. The bushes are very good quality and I got a deal. I cut a few branches and just stuck them in the grapevine. No hot glue. You guys know I can’t do anything the normal way. I like everything off centered usually or asymmetrical or whatever you call it. That’s why I made the wreath like I did. I can turn it anyway I want depending on my mood. I placed the wreath in front of the painting on my mantel to take the photos. The wreath will be going on Mom’s door at the Nursing Home. I like to change out the décor every few weeks. I don’t know if Mom notices. I think she does. It makes me feel better anyway. What do you think of the wreath and all my other thrown together projects? 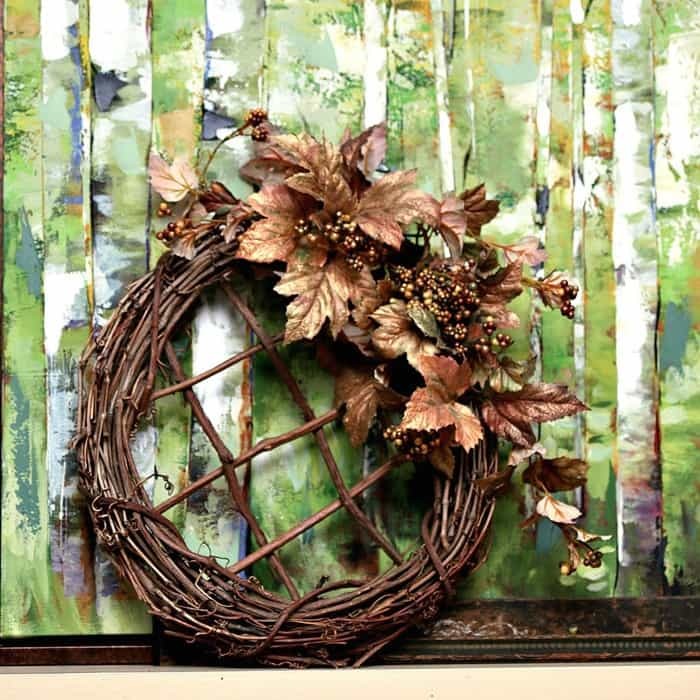 I would really like to hear your opinions on wreaths in general. Do you decorate with them? Do you like flowers all around the wreath? 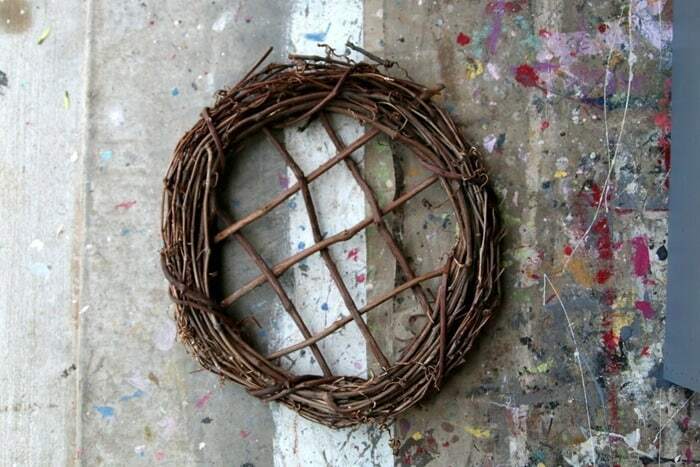 Big wreath, small wreat, any fun ideas using unique items? Leave a note and I’ll see you again before the week is over. Have a great day. I love the wreath…Love the color of the leaves and I always make wreaths like you did..Hey a girl needs to change things up a bit…lol. I love your stool..what a great idea. Isnt the creative mind a wonderful thing. Always thinking how to make something really pretty with castoffs.You accomplished that Big Time!!!! You do everything so well! That silver paint is gorgeous. Love the cake/dessert plate! Thank you Mary. I love that paint! Love your wreath. Actually love most wreaths, no matter how they are decorated. Just made a fall wreath and used burlap, some flowers, berries and some faux pods all from the dollar store. Love making wreaths on the cheap …er thrifty! Great collection of projects. I love the footstool. My wreaths are never full, and tend to be off center. Yours is lovely an I’m sure your mom notices. Thank you Stephanie. I took the footstool to my booth and it sold the first day. Of course the price was only $6. I love your wreath, as someone else commented, the grid in the middle is so unique, more decos would take away from that. I am obsessed with making wreaths! I like to give them away too, when I drive around town and see one on a friend’s door, it makes me feel that my work is not in vain. I’m sure that even if your mom doesn’t consciously ‘see’ the wreath, the colors and textures still resonate, and the care workers probably love them. Here’s some links to my obsessive wreath making. I’ve moved on, though, to making rag wreaths, similar to those that Joanna Gaines uses, with my own special touches. Thank you for the sweet comment. I took a look at several of your wreaths. Very nice. Love the wreath! I also like to make them off center. 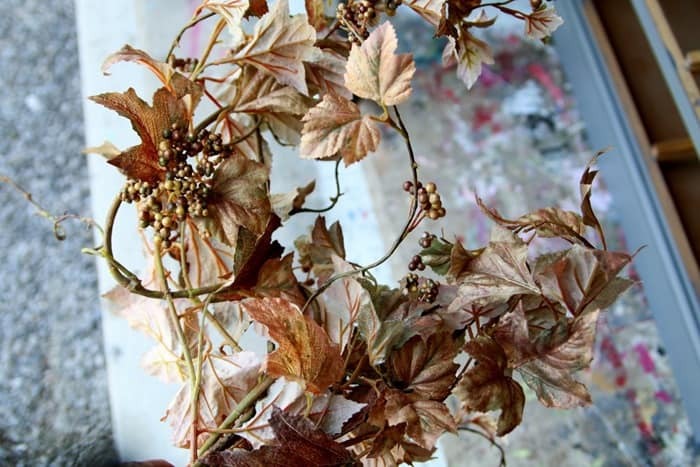 Yours is so very rich looking with the grapevine wreath and gold leaves. 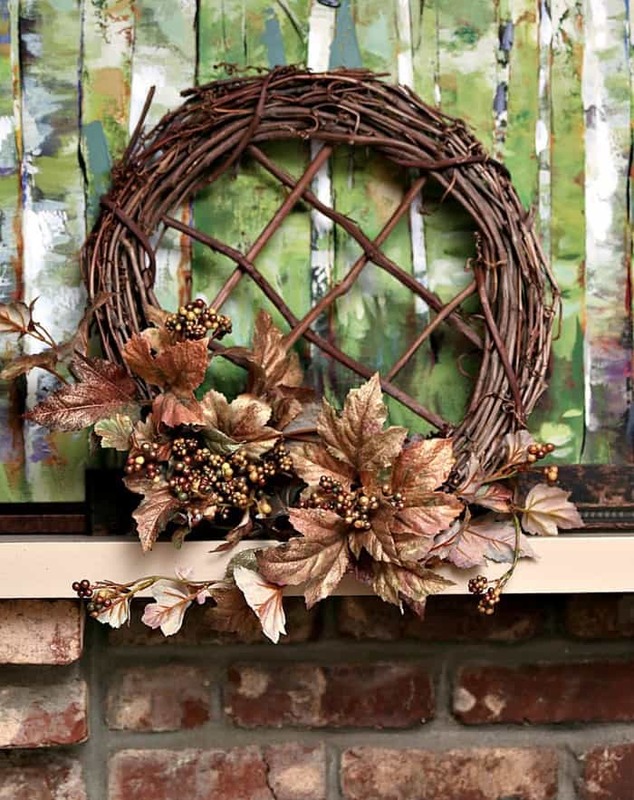 Even though I have my fall wreath ready to hang, I just may have to try it! Thanks for the inspiration!. 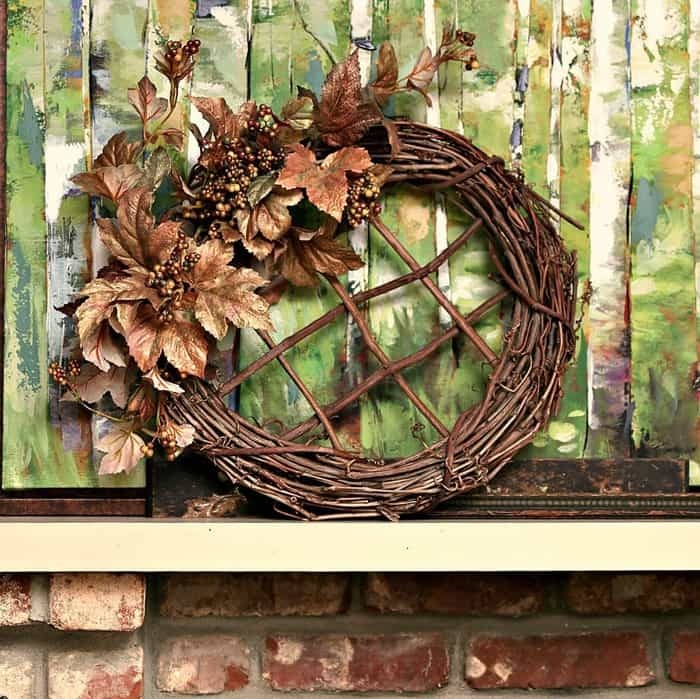 I love the wreath and all the beautiful paint colors. You go girl! Kathy, great minds think alike and mine has been thinking about surprising my DIL with a fall wreath for their front door. She has great ideas herself, just no time to follow through. I love your wreath! I have made a few over the many years. I guess if you would have asked a long time ago I would have been a “cover the whole thing” person but now, like you I want parts of the wreath to show. Your’s has such interest with the crisscross in the middle, and that would have paled drastically if all had been filled in. I have been gathering ideas for my DIL’s wreath and of course Pinterest has lots. Her front door is black and I’m thinking of using a wooden R for their last name on the wreath as I’ve seen done. Also, living in the Deep South, we have access to tons of Magnolia leaves and they look wonderful painted with any of the metallic paints! Yes! My neighbor has a big Magnolia tree and I’ve been known to sneak over there in the dark. Don’t tell anyone. I made a few wreaths for my mom’s door at the senior living apartments. I used my deceased sister’s music books. She loves them. I also made one for my brother and his wife who inherited that sister’s house. They appreciated it, too. Good memories. I, too, have a small footstool to re-purpose. I need to take it apart and re-glue it, because it is quite unstable and rickety. Then, it will be used under something to bring it up to the correct height. What a great idea Fonda. Yes, good memories. I haven’t made any wreaths like those. I don’t think I have the patience. I love your quick projects. It makes me want to clean out! As for wreaths, I love them when they are asymmetric-more interesting! I put anything on a grapevine wreath! I don’t put them on my front door though because birds try to make nests in them. Love birds, just not on my porch!